To make it even more personal, you will be asked to post questions and comments on our Facebook page. If you need help with any of the steps, someone will come to the rescue. They have a special occasion that requires a certain “look”. They found some amazing fabric that they want to use. They found a pattern design that appeals to them. It is hard to find clothing that fits properly. They want to express their individuality through their clothing. So, let’s get started. The pattern that we have chosen to use is Vogue 8897. It was selected because it is easy, has many opportunities to “make it your own”, can be worn by all body shapes, and is timeless. One of the first, and most important things, to do when starting a new sewing project is to read the pattern envelope and direction sheets completely. This is one of those “Good Habits” that I mentioned. Doing this will insure that you have all of necessary tools and supplies for the project. It will also alert you if there is an instruction that you may not understand or a process that you are not sure you have the skills to complete. Let’s look at the envelope for our project. One of the first things to consider is what size pattern that you need to purchase. Each pattern will require individual consideration based on style lines. For our project, my advice is to select the size that is closest to your bust size. This is NOT your bra size! Use a measuring tape to measure around your bust for an accurate measurement. The following measurement tables are from the Vogue website. You can refer to that website for a wealth of information. If you don’t like looking through the pattern books at the store, you can select patterns from this site before you go to the store to buy them. And best of all, you can browse through them in your pajamas! How cool is that! This is a lot of information, and it is wise to become familiar with it. Don’t let it confuse you at this point. Just select the bust size closest to your own, and buy that pattern. We will not delve into individual fitting issues in this blog because they are TOO numerous. If you have a fitting issue, talk to us on Facebook or use the contact form on the bottom of this page. We can help you on an individual basis. 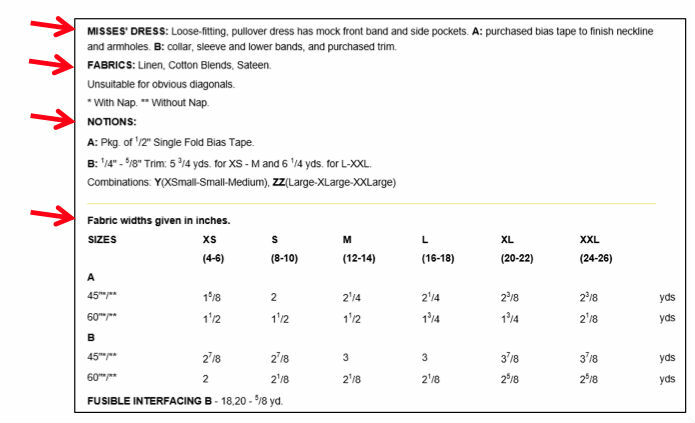 Below is the selection of Vogue pattern sizes that are available. You will notice that the pattern we are using has combined sizes like 4-6, 8-10, etc. 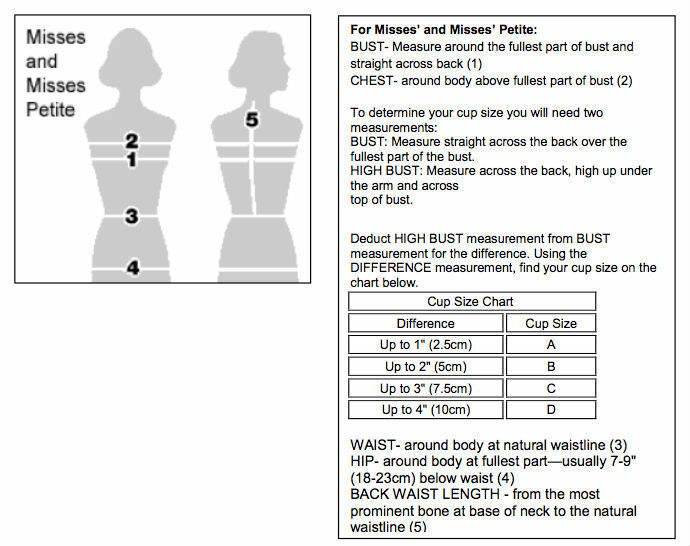 Select the size that your bust measurement falls within. If your waist and hips are larger/smaller than that pattern size, no worries. Adjusting the waist and hips is much easier than adjusting the bust! Now that you have determined your pattern size and have purchased the pattern, let’s look at the information on the pattern envelope. I have used red arrows to call your attention to the different areas of information. This is a description of the garment in basic terms. It goes on to tell you about how the dress will fit. It is “loose fitting”, meaning that it has plenty of ease. It will not be close fitting. If you want your garment to be more fitted, then you can make alterations to make that happen. It is a “pullover” dress, meaning that it does not have a zipper or button opening. It has a mock front band and side pockets. View A requires purchased bias tape that will be used to finish the neckline and the armholes. View B has a collar, sleeves, and bands at the bottom of the sleeves and the hemline. Purchased trim may be added. A recommended selection of fabrics provided to guide you to a fabric selection that will work well with the design of the garment. In this case, recommendations include, but are not limited to: Linen, cotton and cotton blends, or sateen. You can see from this that all of the fabrics are tightly woven with body. Loosely woven fabrics would not be the best choice here. It is also noted that this design is unsuitable for fabrics that have an obvious diagonal design. The reason for this is that it would be extremely difficult to match the pattern around the garment. This is a good place to look at the required yardage chart (shown below for ease of reference). Most fabrics are either in the width range of 44-45” or wider at about 56-60”. Once you have selected a suitable fabric and know its width, follow the grid to determine how much you need to purchase for your size. I always buy at least 1⁄4 yard extra, and sometimes more. This provides for shrinkage and for making test samples. Pay attention to the end of the fabric bolt for washing/cleaning instructions. Whatever the recommended treatment is, clean the fabric in that manner before using it. This will insure that your finished garment does not shrink the first time it is washed or cleaned. A word here about Fusible interfacing: audition the interfacing by laying a single layer of your desired fabric on a single layer of interfacing. Scrunch both in your hand and see how it responds. If they interfacing is too lightweight or too heavyweight, you will be able to see that. Try different weights until you find one that you are comfortable with. This may take some practice and advice from others, but you will soon become comfortable with the process. These are the items that you will need in order to complete your garment. Read this list carefully. Packaged bias tape can be found in almost any fabric store. You can also make your own if you know how. There are some wonderful tools to help you do this, but we won’t get to those here. 1⁄4” to 5⁄8” trim: If you desire to add decorative trim to your garment, this information guides you to a recommended width (1⁄4” to 5⁄8”) and tells you how much to purchase: (5 3⁄4 yards for sizes XS to M, or 6 1⁄4 yards for sizes L to XXL). These amounts are usually sufficient, but feel free to buy a little extra for insurance. You can always use the scraps for another project. Note: I will be offering some alternatives to adding purchased trim when we get to that point in the construction. These measurements are printed on the pattern tissue. Because I want to talk a bit about this, I have included them here. We have covered all the information on the back of the pattern envelope. Go ahead and read the direction sheet included with the pattern. Write down any questions that you may have. We will cover each area very carefully as we go along, but if you have any unanswered questions as we go along, post your question on our Facebook page or email me using the contact form at the end of this page. Sewing machine: If you have a machine, then you are in business. If you don’t have a machine yet, here are some options and pointers. If this is your first endeavor and you want to decide if sewing is for you, borrow a machine from a friend or relative. There are even a few sewing lounges in the area where you can rent time on a machine. If you are ready to purchase a machine, an efficient way to test a lot of machines is to go to an area quilt show. There are usually several companies who attend and bring a selection of machines to test drive. Sometimes the classes at these events will use machines and they will sell them at a show discount at the end of the show. If there isn’t a quilt show handy, then ask your friends about their machines. Perhaps they will let you try before you buy. Visit local sewing machine dealers. There are many in the Dallas area. Once you have decided on a machine that you like, visit all the dealers who sell that brand to see who will give you the best deal. Another factor to consider is the service that is included in the purchase. Some dealers include free lessons on the machine, while others do not. Ask before you buy…it may be the deal breaker between two vendors. Location may also be a factor to consider because your machine will need routine maintenance. Scissors: in most stores, the scissors are packaged so that you can’t try them. Again, ask your friends what they have and ask to test them. We all have different preferences in scissors. And look for coupons or sales…a good pair of shears will be an investment. Those are the big items, but there are numerous small items that you will need. This list is not comprehensive, as you will likely find other tools along the way that make your sewing time more productive. Before I send you out to fend for yourselves, let me offer some excellent resources. This list is not comprehensive, and because a book or website is not listed does not mean that I don’t think they are worthwhile. I am old and forgetful, so most likely I just forgot about them. Also, because I collect books, I can’t possibly list all the ones that I find helpful. If you have a used book store in your area, look there for a bargain. JoAnn stores will allow you to use your coupons to purchase books. The Experts’ Book of Sewing Tips and Techniques – Rodale Press, Inc.
ww.asg.org – home of the American Sewing Guild. Come check us out! www.planoasgsews.org – home of our local chapter. You should already be here if you arereading this blog! See all the wonderful things we have to offer. www.sewing.org – this site has a WEALTH of information with very basic, user-friendly instructions. 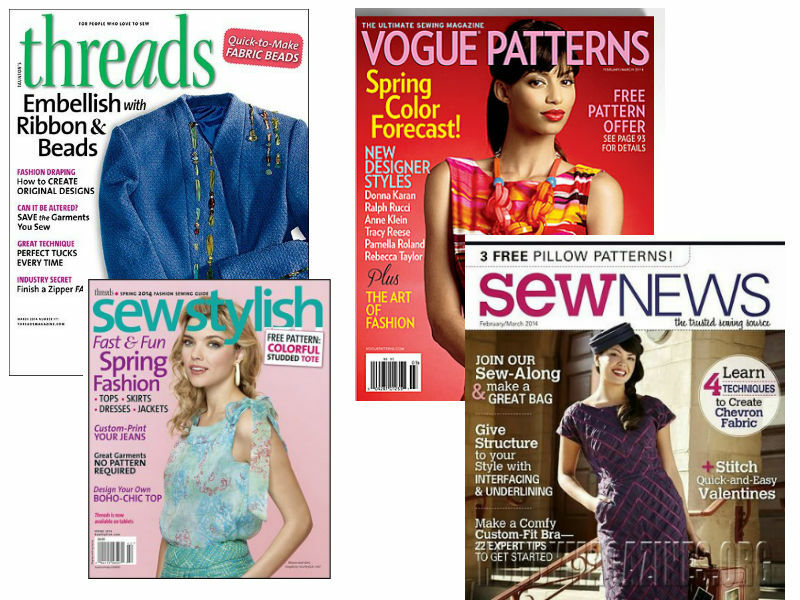 www.threadsmagazine.com – just visit once and you will know why it makes the list; while you’re there, check out all the wonderful sewing resources that are available. If you aren’t a subscriber already and you are an ASG member, you can order at a discount rate through our chapter. www.etsy.com – the place to go for inspiration. As I think of other helpful books, tools, and sites, I will mention them in my blog. Have a great week as you get ready to sew!